Patricia Joan “Pat” Granaas, 85, of Newton died Sunday, February 10th at her home. She was born in Rapid City, South Dakota on October 16, 1933 to Merle L. Hall and Josephine Michaud Hall. She graduated from Rapid City High School in 1952. On August 14, 1954, she married Robert “Bob” A. Granaas at the First Methodist Church in Rapid City. They have three daughters. In 1969, Bob, Pat, and their girls moved to Newton, Kansas. After two decades in Newton, Bob and Pat moved to Carol Stream, Illinois for Bob’s work with Hesston Corporation. They also moved to Norcross, Georgia and Blue Springs, Missouri before returning to Newton in 1999 following Bob’s retirement. Pat was a member of Trinity Heights United Methodist Church. She was a proud member of the Piecemakers Quilting and Sewing Group at Trinity Heights and was lovingly referred to as the “Pillow Lady”. 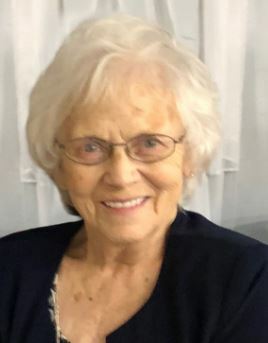 Pat loved to sew, quilt, bowl, play tennis, bake, cheer on the Kansas Jayhawks, and spend time with her seven grandchildren and five great-grandchildren. She is survived by her husband, Bob; her daughter Vickie Scheffler of Newton; her daughter Deborah van der Weg and her husband, Jaap, of Newton; her daughter Tamara Schroeder and her husband, Keith, of Newton; her brother, Charles Richard Hall, of Longmont, CO; her seven grandchildren and five great-grandchildren: Daniel Scheffler, his wife, Tiffany, and their son, Otto, of Kansas City; Katherine Scheffler, of Norman, OK; Michael Scheffler, of Kansas City, Staci Krause and her husband, Travis, of Wichita; Stephanie Kochenower, her husband Matt, and their daughters, Makinley and Madeline, of Sedgwick; Laura Brucker, her husband, Mike, and their children, Cooper and Kolbie, of Rose Hill; and Nicole Warzeka and her husband, Brad, of Wichita. She was preceded in death by her parents and her son-in-law, Robert Scheffler. A memorial service will be held Friday, February 15th at 10 a.m. at Trinity Heights United Methodist Church in Newton. Memorial donations can be made to the Trinity Heights United Methodist Church Kitchen Fund. Petersenfamilyfuneralhome.com. Gecondoleerd heel veel sterkte voor nu en de komende tijd.Ook wij, zullen haar missen..Pat was een lieve vrouw moeder groot en overgroot moeder.We hebben goede herinneringen ze was altijd erg vriendelijk en lief voor the Dutch family.